Laurier donors help to make the Laurier you love possible. That was the message relayed the week of March 21 as hundreds of tags were posted across Wilfrid Laurier University’s Waterloo and Brantford campuses. These tags were placed around campus to showcase and recognize the many areas at Laurier that are enhanced or expanded thanks to philanthropic investments. While not all of the items provided through donations are tagged, every tag highlights the many ways in which donations and philanthropy positively impact the university and the Laurier student experience. 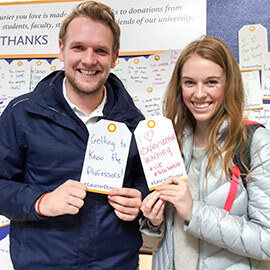 At interactive events hosted by Laurier SAA in Waterloo and Brantford, students were encouraged to say “thanks” to the community of donors who make the Laurier they love possible. In a time of increasing financial challenges, donations to Laurier are even more important. Join us in celebrating our donors for their leadership and their investment in Laurier. Check out the messages of thanks posted to social media this week. To join Laurier’s remarkable community of donors and make your own gift, visit wlu.ca/giving.